The versatile Samsung HT-J4500W 5.1-Channel Smart Blu-ray Home Theater System offers wireless connectivity, content streaming, and powerful multi-channel surround sound. This 500W system consists of a 3D Blu-ray player and amplifier, two front speakers, two surround speakers, a center speaker, and a passive subwoofer. In addition to standard Blu-ray playback, the HT-J4500 supports 3D Blu-ray discs and DVD upscaling. With onboard Ethernet connectivity, you can stream content via DLNA networking and explore the Opera TV store. Once connected, the Opera store offers access to video streaming, music streaming, gaming, and social networking apps. Integrated Bluetooth allows you to wirelessly stream music from Bluetooth-enabled devices such as smartphones and tablets. An HDMI port is onboard for outputting up to 1080p high-definition video to an external display. The HDMI port also supports high-resolution multichannel audio formats like Dolby TrueHD and DTS-HD. Analog audio and optical inputs allow you to connect external audio sources. There's even a USB port for interfacing additional audio sources and ripping CD tracks to an optional USB drive. This system's built-in FM tuner allows you to listen to free over-the-air radio programming. 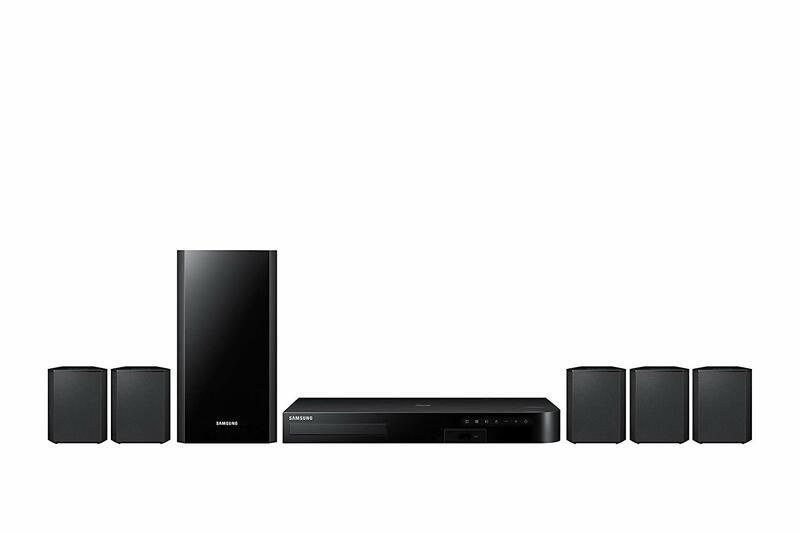 Bring movies, shows, and music to life with 500 watts of dynamic 5.1-channel surround sound. The Samsung HT- J4500 Home Theater System includes a passive subwoofer and five satellite speakers to position around your entertainment room. This setup puts you in the center of the action for an immersive media experience. Get a cinematic experience at home with the Samsung HT-J4500 Blu-ray Player. Pair the player with a Samsung 3D TV and Active 3D glasses to view 3D content the way it was meant to be seen. The Samsung HT-J4500 also delivers full HD viewing for 2D videos and images. Smart Blu-ray functionality on the Samsung HT-J4500 gives you easy access to your favorite websites, games, apps, and media. To use Smart Blu-ray, the player must be connected to the Internet. Choose from hundreds of apps in the Opera TV store to instantly transform your TV into a Smart TV. Streaming a huge selection of movies, shows, games, and information like news and weather directly to your television, Opera TV lets you customize your entertainment experience from the comfort of your couch. The included 3D Blu-ray player not only lets you watch your favorite 3D and 2D Blu-ray discs with exceptional picture and sound quality, but it also upconverts non-HD media like DVDs to near-HD quality. Video upscaling lets you enjoy your old movies and shows with newfound picture clarity. Connect the Samsung HT-J4500 Home Theater System to your television using a single HDMI cable and get digital audio and video transmitted at the highest quality for your movies and shows. Enjoy all of your Blu-ray and HD content with rich, clear audio thanks to Dolby Digital Plus sound. DTS Surround delivers an optimized surround-sound experience with enhanced bass response, clear dialog, and consistent volume levels. The Samsung HT-J4500 features Dolby True HD audio, which processes two-channel audio to deliver full-range surround sound. Thanks to Dolby True HD audio, you will enjoy enhanced bass and crisp dialogue on your home entertainment system. Box Dimensions (LxWxH) 20.7 x 16.3 x 12.8"